City of Leipzig Bronze Medal / Völkerschlachtdenkmal: Peoples Monument of the Battle of Leipzig - 100th Year Anniversary of the Battle of Nations. 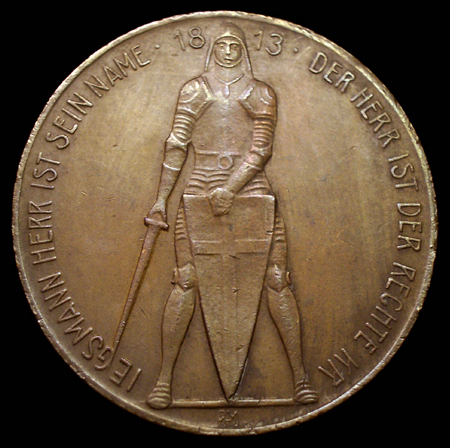 This medal is dated 1913, it commemorates the 100th year anniversary of the Battle of Leipzig, also known as the "Battle of Nations". 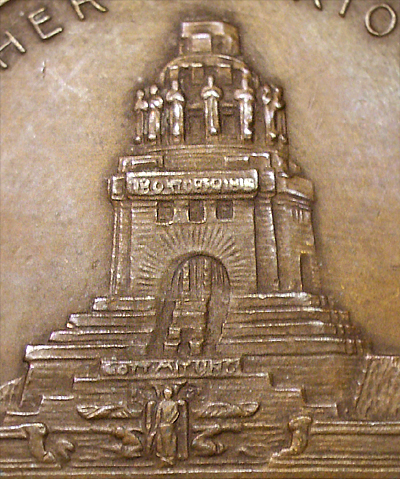 The Medal depicts the Völkerschlachtdenkmal (Peoples Monument of the Battle of Nations) in the city of Leipzig Germany. It also depicts the giant armored statue of St. Michael standing guard at the base of the monument. 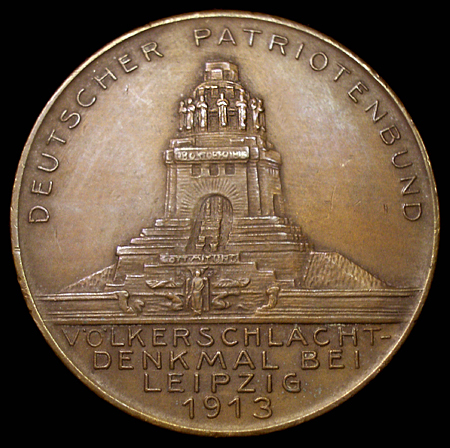 It is one of several different medals and coins issued depicting the Völkerschlachtdenkmal. 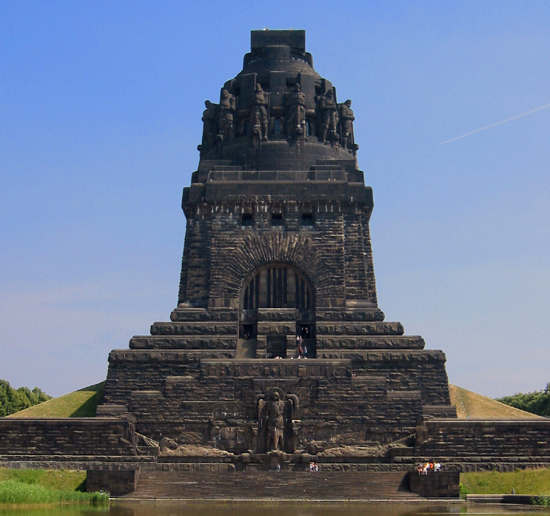 The Völkerschlachtdenkmal is a massive structure, among the world's largest war memorials and the largest in Europe. It commemorates the defeat of Napoleon and the French Empire, by the Prussians, Russian, Austrians and allies under the Sixth Coalition, at the Battle of Leipzig in 1813. It was the largest battle in pre World War I Europe with more than 500,000 troops from all over Europe including France, Italy, Russia, Austria, Prussia, Sweden, and Spain among others. All German states took part in the war fighting on both sides. At the time of the Battle of Leipzig, the city was a part of the Kingdom of Saxony under Friedrich August I. Saxony was one of the states that made up the Rhine Confederation, Germanic states under the control of Imperial France. In the face of an ultimatum, Rhine forces, including Friedrich August I and Saxon troops, complied with Napoleons demand for the full resources of their kingdoms. Most important was the cooperation of Saxony who had made a failed attempt to make a pact with Coalition nations. Saxony, specifically Leipzig, would be where France and its allies would deploy its troops and where Napoleon would make his stand. The Rhine States were less than enthusiastic about fighting for the French Empire. Many deserted to the Coalition as soon as it was apparent that the French would be facing a renewed and reinforced coalition force. Coalition forces defeated French Imperial forces and their allies. Combined casualty estimates range from 80,000 to 110,000 total killed or wounded. Napoleon with about 38,000 killed and wounded, 15,000 captured, 21,000 wounded. Out of a total force of 362,000, the Allies suffered approximately 54,000 casualties. This defeat spelled the end of the Rhine Confederation and French presence east of the Rhine. It meant the liberation of German States, most of whom joined the Coalition invasion of France in early 1814. This invasion forced Napoleon from the throne of France and into exile. Saxony would join with most of the German states to form the new German Confederation. The Völkerschlachtdenkmal was built on the spot of the bloodiest fighting of the battle and paid for entirely by donations by the people and a lottery, independent of the state. The peoples monument took 15 years to complete, work was finished in time for the 100th anniversary of the battle in 1913. 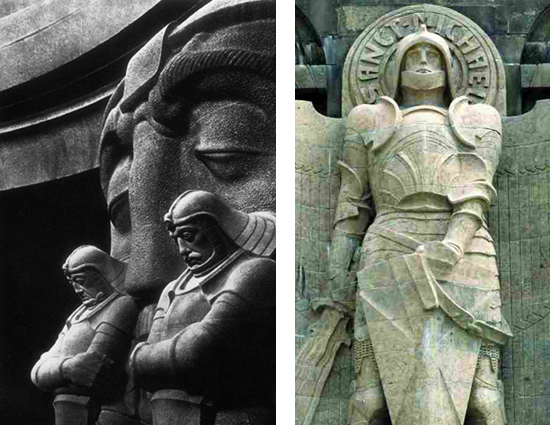 The architect of the monument was Bruno Schmitz, and the many outstanding, stylized carved figures are the work of sculptors Christian Behrens and Franz Metzner. It is 91 meters tall and contains over 500 steps to a viewing platform at the top from which one is afforded a view of the city. Stationed in front is a colossal statue of the archangel Michael. Around the top of the massive structure are colossal statues of warriors with heads bowed as if in morning or prayer. This theme is followed inside with similar stylized mourning warriors standing in pairs in front of giant expressive, somber faces called "Masks of Fate". Carved above are monumental seated figures representing concepts such as sacrifice, faith and strength. It represents the pinnacle of Grande German Imperial architecture. Bold and powerful yet somber and dream like. It evokes German heroic themes in the form of other worldly Teutonic knights, the romance and honor of sacrifice, and loss for a greater cause. Most of all it speaks to freedom, victory, unity and vigilance. A year after its completion, Germany would become a major combatant in the first world war. At the conclusion of that war, the German Empire would cease to exist. It was later used as a backdrop and rallying point by Hitler and the Nazi Party who saw it as a major symbol of German greatness, power, unity and strength. Some today still see the monument as an overbearing symbol glorifying German Nationalism, Imperial military culture and war. Regardless of what the monument represents, it cannot be denied that it is an architectural and sculptural masterpiece.